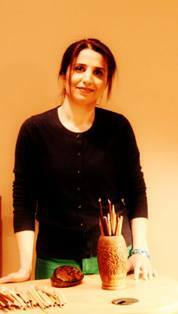 Mitra Ghavamian is a Toronto artist of Iranian origin. 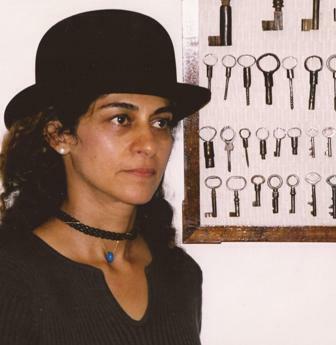 After graduating from the University for Dramatic Arts in Tehran in 1980, she began a career as a painter and a costume designer for theatre and film. From 1980 to 1994 Mitra has designed costume for number of feature films such as Nar-O-Nay, The Portrait of Love, David Flowers, TV series such as Amir Kabir, and more than 20 theatre productions in Iran. Since immigrating to Canada in 1994, she has continued her work as a scenic painter and breakdown artist for film (X-men, Resident Evil, Bulletproof monk, Wrong Turn, etc.) and theatre (such as the Lion King). Mitra has been nominated twice for the Pauline McGibbon Award for a production crafts person and once for the New Pioneers Award for an artist. 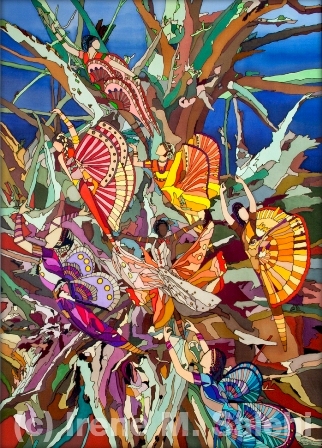 Mitra exhibited her new collection called, Naghashi Ghahvekhane (Coffeehouse painting), at the Visual Arts Ontario Gallery (2007), Hittite Gallery (2008), and Varley Art Gallery (2011). 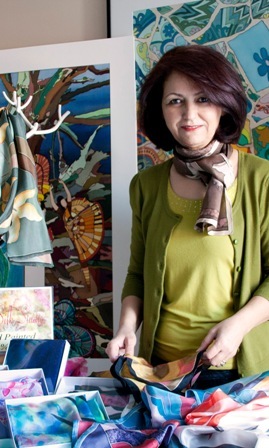 The paintings that will be showcased at Royal Ontario Museum during Iranian Heritage Day are ten of Mitra’s paintings from her coffeehouse collection. 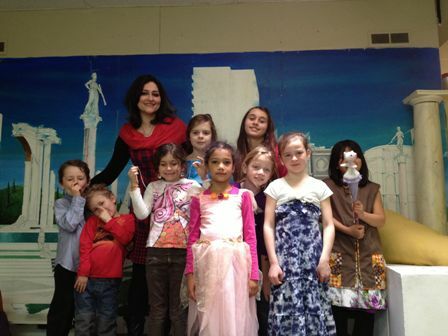 Parisa Yazdanjoo, visual artist and teacher at the Kingston School of Art. 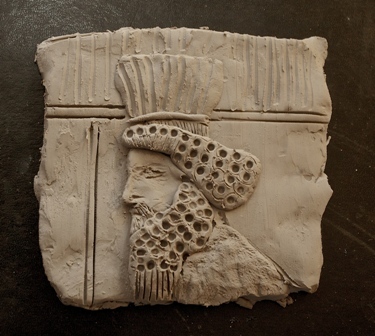 Enjoy the history of Ancient Persia as you learn how to make Persian sculptures that are inspired by clay figures and pottery on display in the Wirth Gallery of the Middle East. Create your own unique piece of art inspired by Ancient Iran! 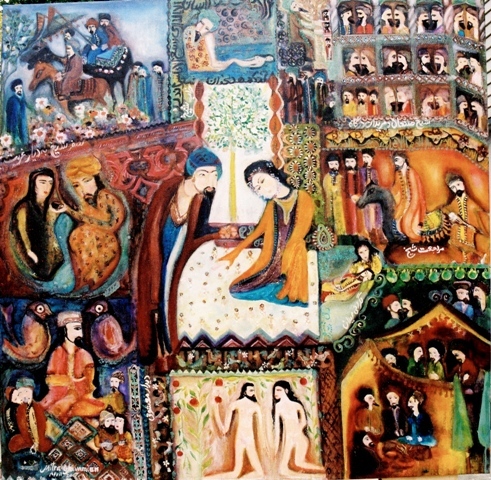 Matin Soeizi displays paintings that are combination of “tazhib” and “miniature”. Tazhib is a style of painting that has been used as decorative art. This style has been used for many different decorative purposes which can range from books to architecture. 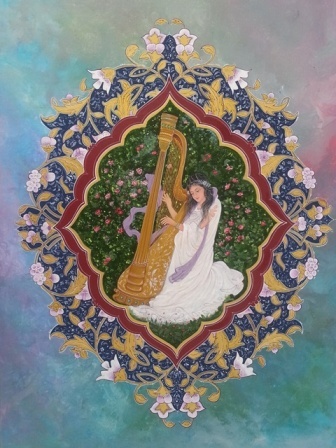 Miniature is also another style of painting which can be traced back to hundreds of years in Persian art. 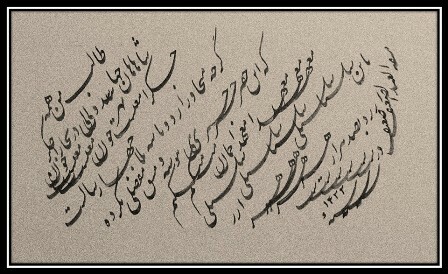 Matin has been a student of Master Alijanpour in the past year. 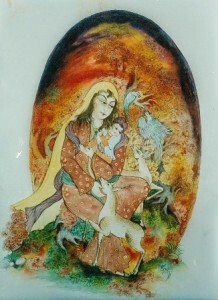 Irene Monique Salehi took silk painting courses in Paris in 1977 and was accepted at the Art University in Tehran in the Craft and Design program. She attended the Textile Design Program at Sheridan College, where she developed skills including screen-printing, patterning, block printing, and felt making. Her true passion remained silk painting, even with the experiences with other mediums like oil, water-colour, acrylic and vitry. Her work on silk began with years of creating fashionable work of wearable art. With time, her paintings shifted into the fine arts. Each painting is unique and takes up to months to complete, but the themes of her paintings remain diverse. Nature, social issues, and her own personal experiences drive the meaning behind each and every creation. Using traditional reed-pens and inks, you can try your hand at calligraphy, one of the most highly regarded art-forms in Persian culture. From grand palaces and stone carvings to painting on silk, golden fabrics, and decoration of valuable books. Sedigheh Saleki Is honoured to pay tribute to this ancient art form by presenting Miniature workshops for all those interested in having a glimpse into this captivating world.